Easily performed at any cutaneous mucosal site (including bladder studies). Reproducible- Neurometer results have been proven to be reproducible in studies performed at 10 minute intervals or over multiple days with lifetime studies from the NIH as long as 103 weeks. 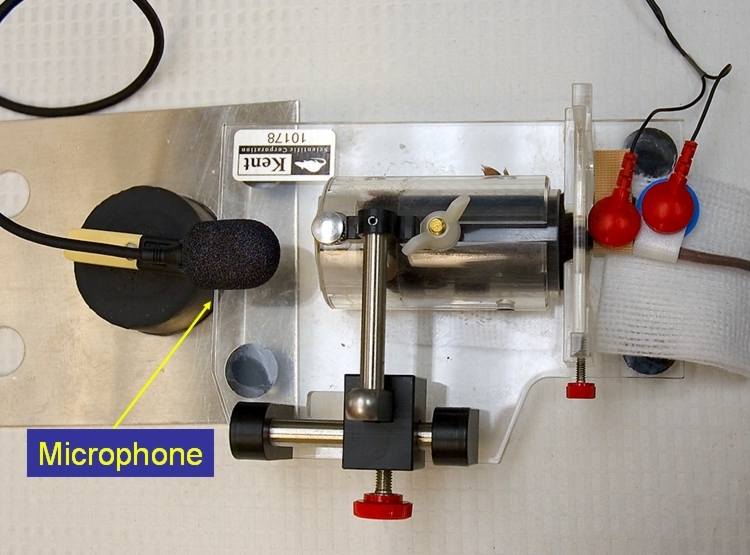 The NIH researchers concluded the Neurometer vocalization studies were non-injurious, lack the habituation reported with thermal and mechanical stimuli and contributes to the armamentarium of tools to study nociception. 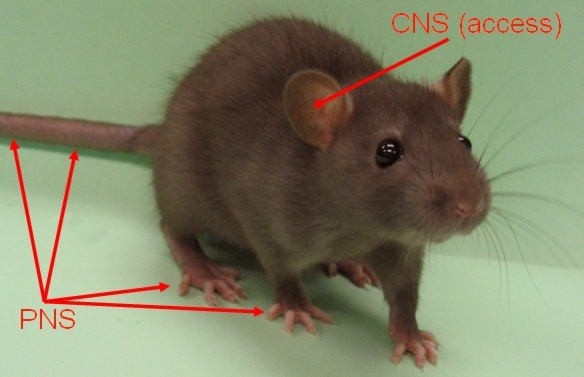 Quantifiable- Neurometer results are measured with a numerical score at each nerve sub-population which can be compared to like scores of other animals and over time with the same animal. Neuroselective- Neurometer independently evaluates A-Beta, A-Delta, and C-Fibers of sensory nerves. Each sub population of nerves provides unique research information that is lost with generic pain testing. 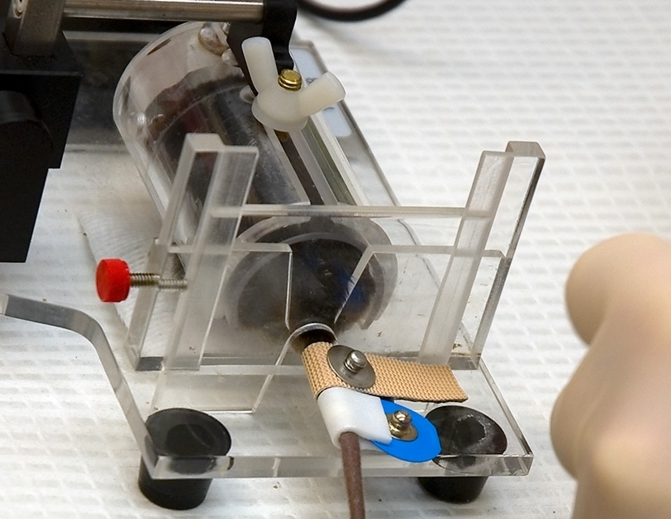 Laboratory animal testing is performed using a small testing electrode in combination with a dispersion electrode which may be cut down to a custom size. 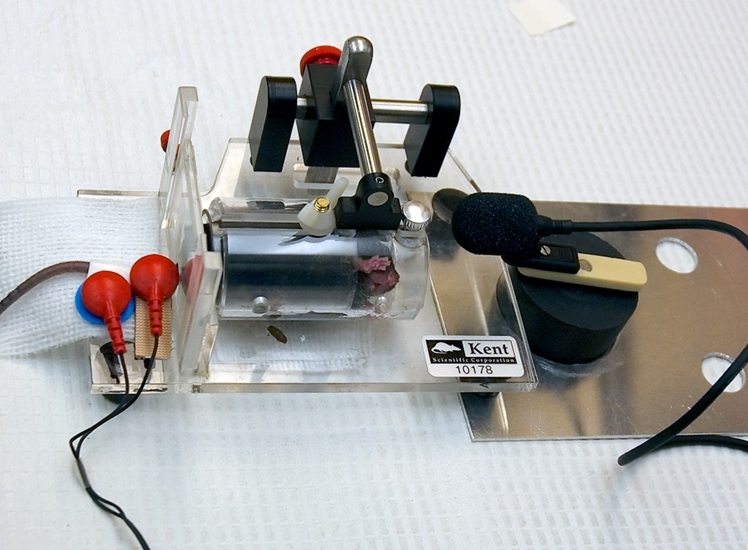 For example the mouse below is in a restraining tube, with a microphone in front of the tube and a stimulating and dispersion electrode placed on the tail. Lifetime Study Reference: Finkle, J., Besch, V., Hergen, A., Kakareka, J., Pohida, T., Melzer, J., Koziol, D., Wesley, R., Quezado, Z. Effects of Aging on Current Vocalization Threshold in Mice Measured by a Novel Nociception Assay. Anesthesiology. Vol. 105;360-9, 2006. National Institutes of Health, USA.